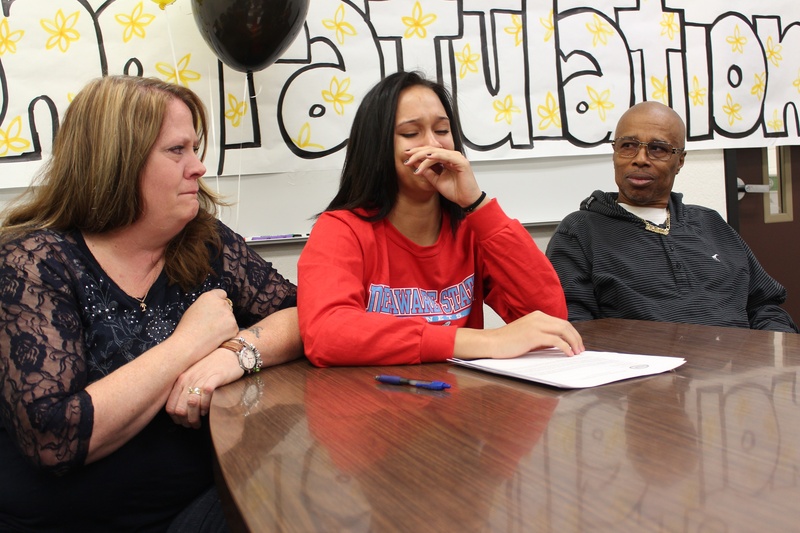 Clark girls basketball star Bobbi Floyd was looking forward to a big week. 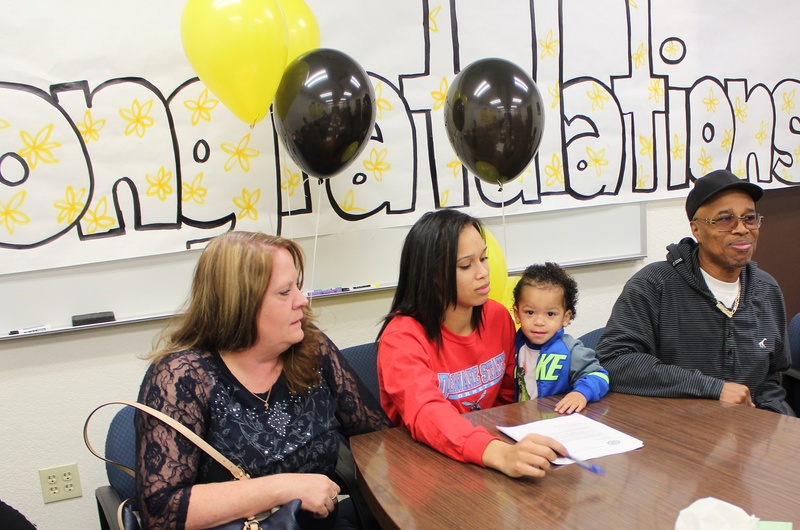 Not only was she planning on embarking on her senior season, she had a press conference scheduled to ‘officially’ announce she would be attending Delaware State on a basketball scholarship while her nephew, Kash, turns 2 years old on Dec. 11. She couldn’t have been any happier Sunday night, after a celebration for Kash’s birthday. That came to an abrupt halt Monday around 3 a.m., when there was a knock at the door at the Floyd household. Kash’s mother, Monique Gittens – Floyd’s sister – died of heart failure. Nevertheless, since hearing the news that her sister passed, she’s been to school, practiced with her team and is preparing for Wednesday’s season-opener against Pahrump Valley. 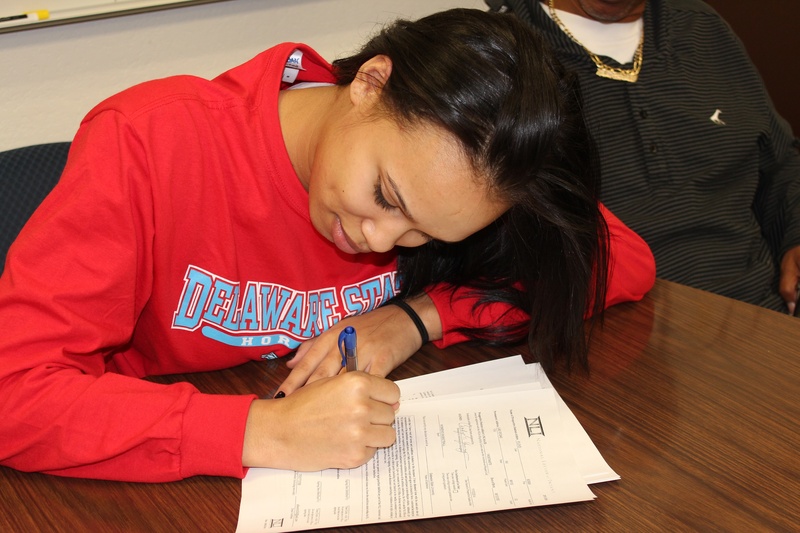 Tuesday morning she held a ‘mock signing’ to commemorate the letter-of-intent that is already on file at Delaware State. Floyd didn’t have a chance to hold an official ceremony last month, and scheduled it for the day before the season, allowing her teammates, coaches, friends, Clark’s administration and all of her family to attend. Floyd spoke briefly to everyone, thanking them, and then she paid homage to the one relative she considered to be her best friend. The emotional scene got to most everyone there, but Floyd said she’s using her loss as motivation for the upcoming season. Clark was ousted from the Division I-A semifinals last season, when Boulder City outscored Clark 35-7 in the second half, including a dominating 22-2 fourth quarter, en route to a 58-33 victory. Behind a cast of blue-collar players, and fifth-year coach Mike Moulchin, Floyd is determined to get her Chargers back into the postseason, and into the state tournament. Moulchin has had Floyd on varsity since her freshman season, and said he’s seen plenty of maturity since her first season donning black and gold. Floyd went from scoring more than 300 points her freshman year, to averaging 19.8 points and 15.6 rebounds per game last season. Add in her near 5 blocks per game, and Floyd is arguably one of the fiercest post players in Division I-A basketball, and quite possibly in the state, all around. Moulchin said he talked with his star player over summer, explaining about her needing mental toughness for college, since she’ll be roughly 2,500 miles away from home. He explained to her that when she arrives in Dover, it’ll be an entirely different brand of hoops, with at least a handful of players better than her and another seven just as good. What he didn’t think was she would need a boost of mental toughness to start her senior campaign, due to personal loss. So when she takes the court Wednesday night in Pahrump, she’ll have her sister’s initials on one shoe, and the date she passed on the other shoe. Arbor View senior M’Shale Easterling (standing) was involved in an tragic car accident that took his mother’s life on Sunday, and put him and his sister in the hospital. Monday night he arrived at Arbor View midway through the fourth quarter to lift his team’s spirit at the right time, vs. Sierra Vista. It’s almost chilling, what happened Monday night in the men’s basketball game between Arbor View and Sierra Vista. After all, there was somewhat of an arctic feel to the day for anyone involved with Arbor View – staff, students, parents. One day earlier, after a 17-year-old driver ran a red light, according to police, and collided with Nneka Geter-Easterling, 42, in her Mustang. The beloved member of the parental body at Arbor View died. Her teen-aged children, senior M’Shale and sophomore Nekea, were admitted to UMC’s trauma center. Arbor View was devastated by yet another tragedy. Personally visiting the school mid-Monday, there was a stoic feel inside. Call it bleak, if you will, as most were a tad melancholy, just saddened knowing two members of the nine-year old institution had to deal with loss. While some were unsure of M’Shale and Nekea’s conditions, everyone knew they had survived and were to be released over the next 48 hours. Nonetheless, and as they say, the show must go on – there was a basketball game on the schedule. Fifth-place Sierra Vista was coming, and it was Senior Night. 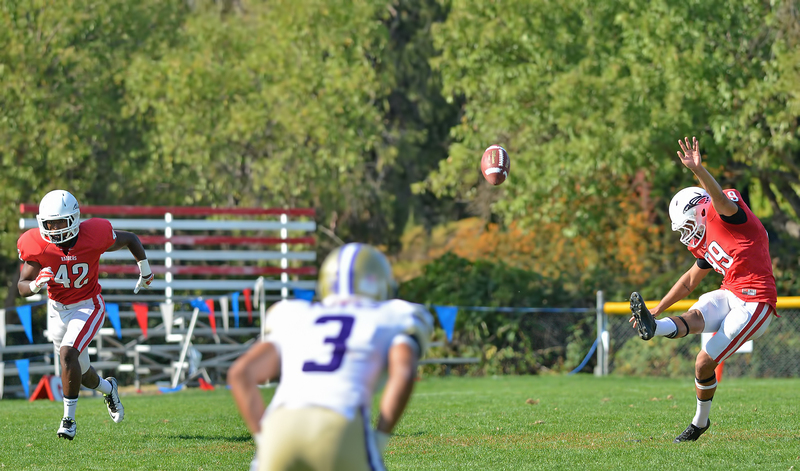 The Aggies were coming off a heartbreaking, and somewhat controversial, loss at Durango last week, and the emotions were running high. Adding to the anxiety, M’Shale is the manager of the basketball team. 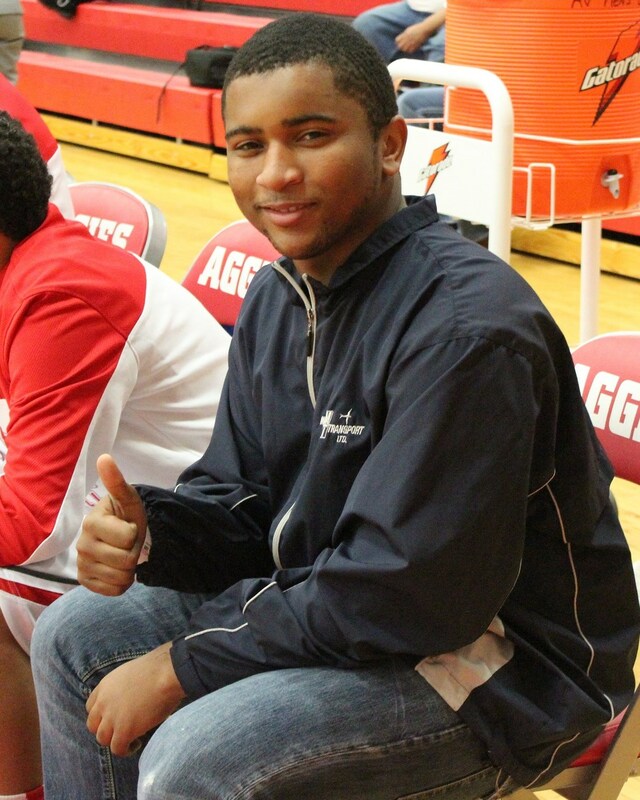 His best friend, and fellow senior, Charles Porter is a key member of the team. The rest of the Aggies, well, they all love their team manager, and there they were about to take the court while their close friend was lying in a hospital bed with swelling on the brain. Sierra Vista jumped out to an early lead in the game, until Cal Santa Barbara-bound Justin Burks drove baseline and delivered a nifty reverse lay-up to put the Aggies ahead, 12-11, with 2:31 in the first quarter. The Aggies closed the quarter on a 12-7 run and led 20-18, as senior Terrell Butler led the charge for Arbor View with seven points. The game flow seemed erratic, as there were flashes of the “Runnin’ Aggies” the fans had become used to, and then flashes of a pedestrian team that seemed to be elsewhere, especially Porter, who was visibly shaken. The 6-foot-1, 200-pound guard didn’t seem to have a grip on the game, let alone the ball or his jump shot. After all, he had just lost someone who was like a second mother to him. Arbor clung to its small lead over the Mountain Lions, and went into the locker room with a halftime lead of 39-32, with Butler leading all scorers with 18 points. Halftime ceremonies included the introduction of the seniors on the team and the seniors on the cheerleading squad. And though the Grateful Red cheering section was exuberant for their Aggies, the players still seemed rattled. Something was missing. Someone, for that matter. After both teams traded 3-point buckets to start the second half, the Lions began to stalk, and the Aggies were their prey. Sierra Vista didn’t just hang around; it closed the gap and with 1:18 left in the third quarter, and trailed by one, 53-52. At the end of the third quarter, it was the Lions who took a 57-55 lead into the final frame. The lead grew to seven, and while the Lions’ wave of blue in the visiting stands became rowdy, the Grateful Red looked more like a Painful Red, as its team looked like it couldn’t do anything right. Missed passes, booted balls, misguided shots – it looked like, at times, the Bad News Bears had taken up basketball. At this point there’s no telling how to describe what was about to take place, though someone on social media mentioned divine intervention. The one person who could make things right and get the Aggies on track walked in. Heck, the only thing missing was a glowing light, and a church choir-like roar. M’Shale Easterling gave a thumbs up upon arrival at Arbor View High School on Monday night. 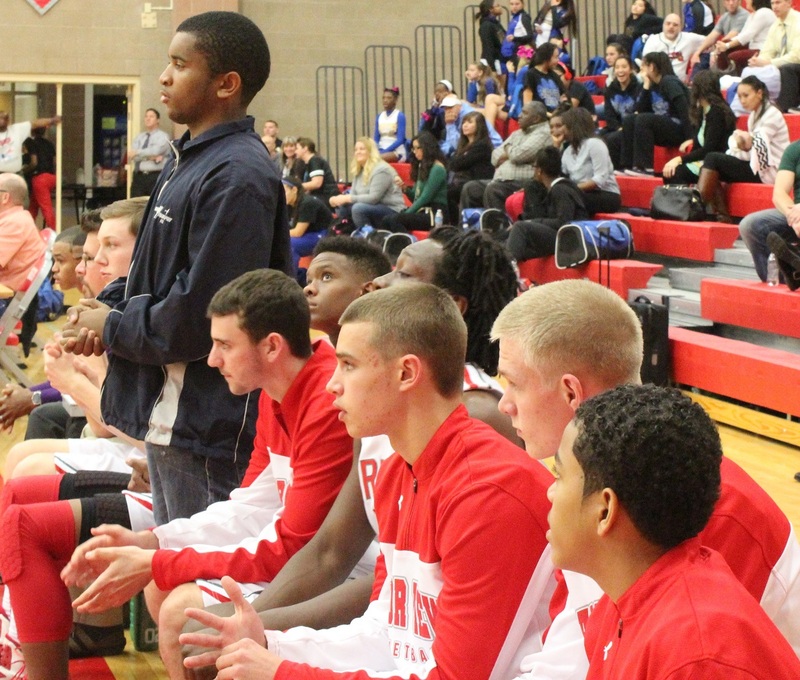 M’Shale walked into the gym and straight to the Arbor View bench mid-way through the quarter, while the Aggies were still battling against a seven-point deficit. Porter had three points in the game at that point, having made three of four from the free throw line. For the most part, Butler and Burks had carried the team; meanwhile, point guard Corey Moore was doing all he could to will his team together and stay out of foul trouble. Sierra Vista had a 71-68 lead with 1:54 left in the game, and was still ahead, 75-74, with 37.5 seconds left in the game. The Aggies had a chance to take the lead with 17 seconds left, but senior Tristan Lacy’s valiant effort from the corner didn’t fall. The Lions extended their lead to 76-74 after splitting two free throws. Moore had fouled out by this time, and Porter was at the point. So with four seconds left, Porter took an inbounds pass, drove down the right-hand side of the court, looked to the middle, shifted back to the right and took it straight to the rack, laying it in as time expired and the buzzer sounded. Overtime, 76-apiece. The Mountain Lions had no chance from there, as the place came alive and everything was back to normal. The Aggies used a 17-4 outburst in the extra frame and sealed their win on Senior Night, 93-80. M’Shale said he’d tried out for the basketball team as a junior and didn’t make the squad, and it was his mom who encouraged him to stick with his boys and become the manager of the team. It was a decision that made him feel like he was a part of the team. “I told her I would do it and I would always support them,” M’Shale said. “I felt like if she wouldn’t be able to be here, she would be disappointed that I wasn’t there. I wanted to see my boys play. I don’t have no fears. Nothing can hold me back except God and I just wanted to see my boys play on Senior Night, because I’m a senior too. Burks, who led all scorers with 31 points, admitted it was clearly the turning point of the game, when M’Shale walked into Arbor View’s gym, giving the team the spark it needed. Butler finished with 30, while Isaiah Simmons had 13, and Porter finished with 12 for the Aggies. And while that frost around Arbor View may have melted when Porter’s coast-to-coast layup sent the game into overtime, those feelings running up and down your spine, those are chills. Amid all the sports posters on Arbor View assistant coach Sam Toomer’s wall, nothing else mattered than the Battle of the Bulls trophy, which Arbor and Legacy will play for. FOR A FULL RECAP – STORY AND VIDEO – visit MyLVSports.com! Last year Arbor View High School football coach Dan Barnson forgot to pull the Battle of the Bulls trophy out of the school trophy case for the Saturday team meeting before the Aggies’ annual showdown with Legacy. This year the horns were present. To say the least, as the Longhorns and Aggies started the traditional trophy game seven years ago. Legacy won the first three meetings, and Arbor View has won the last three. Thursday night, one of these schools will be 4-3 in the series. It’s not ESPN or Fox Sports, but when the teams kickoff Thursday night, they’ll be under the local television lights, as My LVTV’s weekly Thursday Night Lights broadcast is the Battle of the Bulls. Local on-air talent Brian Blessing and Kenny White from ESPN Radio provide play-by-play commentary, while Steph McKenzie from 97.1 The Point provides sideline reporting during the game. It’ll mark the second straight week the Longhorns have been on the broadcast, as the TV crew was at Mojave last week for Legacy’s 27-6 victory against the Rattlers. In past years the My LVTV crew has noted during the broadcast about Arbor View’s notorious Grateful Red section, which rivals any school’s fan section in town – whether the Aggies are at home or on the road. “We’re fortunate and it’s always been like that,” Barnson said. “We’ve always had a great fan base and support from the community, and we feel we want to put the product out there now to support the fan base. 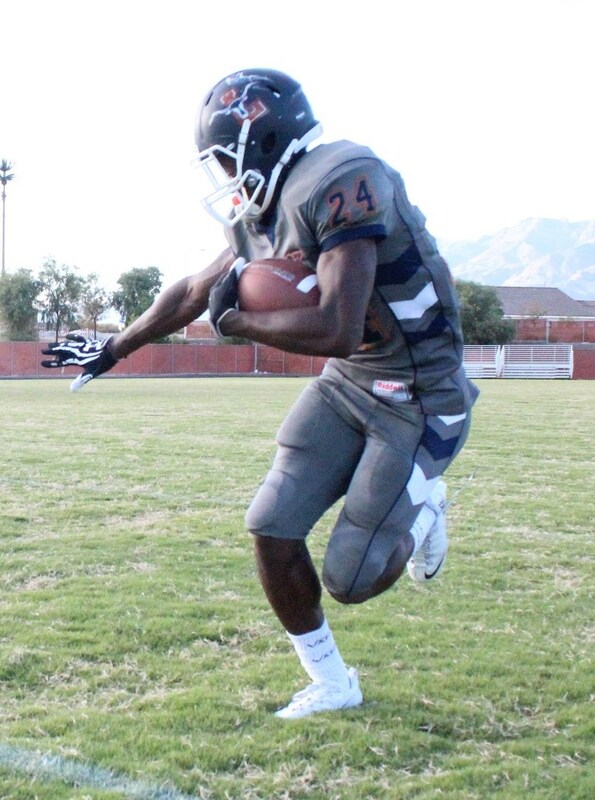 This year Legacy arguably has one of its best programs since the school opened, and the enthusiasm has senior running back Casey Hughes believing his Longhorns will be well-represented for the drive up I-215, from North 5th Street to Buffalo and Grand Teton. What most may not realize is the friendship Barnson and Legacy coach Dave Snyder share, as the two have known one another since they were six years old. They went to elementary school together, went to the same middle school and both attended the same high school. Their fathers were legends in this town and coached against one another. Now they’re doing the same. And as much as the two enjoy the rivalry, and camaraderie it continues to build each year, Barnson said it’s not an easy game to coach in either. Ultimately, past all the build-up, social-media trash talking, television hype and even the trophy, it comes down to the actual game, the actual Battle of the Bulls – the Arbor View Aggies and Legacy Longhorns. And this year figures to be a dandy, with Legacy arriving with arguably the town’s most talented running back (Hughes) to face an Arbor View defense that has locked down Centennial and Coronado in consecutive weeks. The Aggies, ranked second in the Southern Nevada Football Coaches Poll, has allowed a mere seven points in two games, and rolls into this one fresh off their 42-0 whitewash at Coronado. Legacy’s Casey Hughes ranks No. 1 among Division I rushers with 584 yards, while averaging 13.9 ypg. An understatement for sure, as the Longhorns would love nothing more than to open holes for Hughes, who leads all Division I rushers with 584 yards after three games. 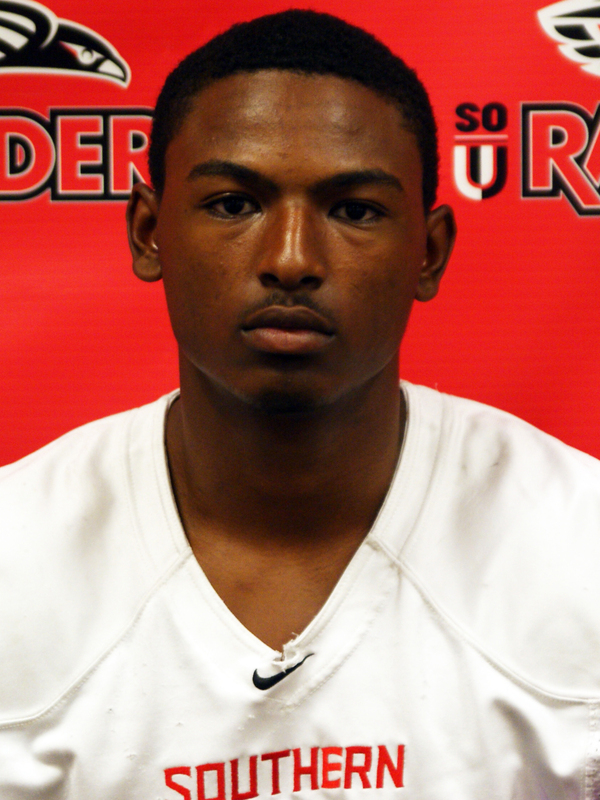 Hughes is averaging 13.9 yards per carry and has seven touchdowns. Turner, who doubles as a running back and defensive back for the Aggies, said he’s been impressed by the effort of his teammates at practice all week. As does Hughes, who acknowledged the same respect toward the Aggies. Kickoff is scheduled for 8 p.m. Whether in person at Arbor View, or watching on My LVTV, this is one annual rivalry prep football enthusiasts, classmates and even alumni don’t want to miss.